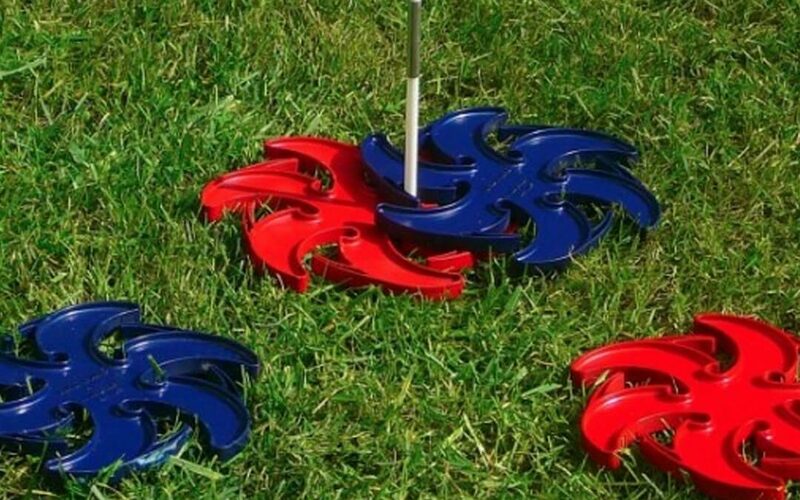 Fling a Ring is an new outdoor game, that is like a combination of horshoes and frisbee golf. The scoring is just like horseshoes and the disc’s throw like a frisbee golf. Played with 2 to 4 players, this game is designed for all ages, just adjust the poles closer or farther together. Instead of throwing heavy horseshoes you throw lightweight rings that can wrap around the pole. The almost ninja star design of the ring make it easier to land around a pole and much easier then getting a ringer in classic horseshoes. This is an outdoor game for kids and adults that will be the ringer at your next beach day or family event. Here is our review and rules on how to play the Fling a Ring Outdoor Horseshoe Style Game. Fling A Ring comes with 4 disks, 2 in each color or blue and red, and 4 posts. Once you have removed the game from the package you will want an adult to stick the pole into the ground and put a flag on it. Because the poles are required to be stuck into the ground, you can only play this game on grass or at the beach in sand. You cannot setup on pavement or gravel. Setup the posts outside approximately 5-15 feet away from each other. The objective of the game is to throw your ring and get it as close or touching the pole as possible. A fun alternative to this game is moving the poles 15+ feet away, and like a par 3 in golf giving the kids 2 or 3 throws to get it and hopefully on the pole. First team to get to 21 (or whatever number you decide) in wins by 2 points wins! The unique design of the Rings is what makes it like horseshoes for kids, but better. Scores just like horseshoes 1,2,3 points or get a 4-point ringer. The ring design has a feature similar to a locking system. Once you throw the ring and it clips onto the pole, it’s not going to easily bounce right back off. This unique locking feature is the patented design of Fling a Ring that sets them apart. To get the most points, you want the ring to get to the pocket closest to the core of the ring for the most points. This is a challenge to do, but so is getting a ringer in horseshoes. You can see the image below for more clarification. • 1 point if it lands within a rings distance of the pole. • 2 Points if any parts of the ring touches the pole. • 3 points if the ring locks around the pole. • 4 points if the small circle of the ring wraps around the pole. After searching for an outdoor kid game like Horseshoes we are really glad we found this. A friend of ours recommended it and after seeing all the kids at the birthday party playing it we know we had to get it for our backyard. 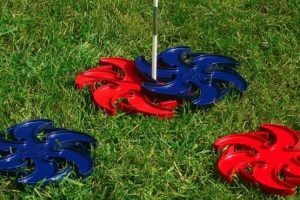 Kids love throwing frisbees and this combines both the aspects of horseshoes and more all in one. It takes a little practice but is a family friendly game that you will love to play with your kids. Fling a Ring has been featured on our Backyard Games for Kids List and our Ultimate Outdoor Games List. Game description: Fling a Ring is an new outdoor game, that is like a combination of horshoes and frisbee golf. The scoring is just like horseshoes and the disc’s throw like a frisbee golf. Played with 2 to 4 players, this game is designed for all ages.